Please note the accommodation units and huts at Wangapeka are now fully booked for this retreat. Alternative accommodation in tents or off-site may still be possible. If interested in these options, please inquire using the contact details below. A meditation retreat on the Tantric Vajrasattva meditation from the Drikung Yangzab Dzogchen lineage. This is a profound method of purification and meditation to free frozen and hidden habit patterns and reveal one’s stainless innate nature. Dzogchen (dzogs pa chen po)—Great Completion—refers to both the path of recognizing mind’s innate pristine wisdom and the full realization of Buddha-nature. 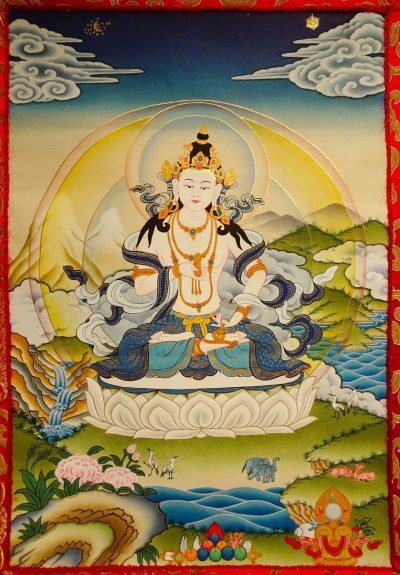 The retreat will start with teachings on the Drikung Yangzab outer and inner Preliminary practices, including Vajrasattva. In addition, Lama Mark will give teachings on both śamatha (calm abiding) and vipaśyanā (penetrative Insight) meditations and their unity, and guide Vajrasattva meditations with emphasis on the view, meditation and conduct of the tradition of Dzogchen. There will be opportunities for interviews with the teacher. Teachings and practices in this retreat are in the lineage Padmasambhava revealed by the great Tertön Gyalwang Rinchen Phuntsog (1509–1557) of the Drikung Kagyu and passed down unbroken through to Lama Mark’s teacher Ven. Lho Ontul Rinpoche. The texts of the Drikung Yangzab Dzogchen outer and inner Preliminary practices, including Vajrasattva will be provided to retreatants. Lama Mark will be bestowing Empowerments. We are still finalising costs for this retreat as Lama Mark’s overall 2017 teaching schedule takes shape, but approximate costs are now expected to be: For Wangapeka Members: NZ$2,500 For non-members: NZ$2,700 This fee includes all accommodation, meals, cooks fee, materials as well as a contribution towards Lama Mark’s anticipated travel costs. As we get closer to the retreat and things start to firm up, we hope to be able to revise these costs downwards, but please budget for these amounts at this stage. These course fees do not include any payment for the teacher / teaching. In accordance with Buddhist tradition, Lama Mark offers the teaching of Dharma out of generosity. There will be opportunity to offer dana / donation for Lama Mark in return, in appreciation of the teachings and to help support the continued flow of Dharma. Please give as generously as you can (within your own means, of course…). As a rough guide, we suggest allowing for about NZ$30 per day, but this should be considered in light of your individual means. Dates for this retreat are now set at Tuesday February 28 – Thursday 30 March 1, 2017. Please direct all inquiries and expressions of interest to Jonathan Chambers – info@openbreath.org, +64 21 1860 476.